We are working to automatically redirect you to our new website but in the mean time, please go here for the new site!! The Spring Schedule is Here! The Irish are looking forward to a full Spring schedule, including an exciting new tri-meet with Purdue and Marietta on March 21st! With a training trip to Clemson,SC to start off the season, it looks like an Irish wake will be sweeping over the Southeast from March through May. Spring Training Comes to a Close! Junior Sam Hocking rows during an early morning practice in Clemson. For spring break, the Notre Dame men’s rowing team traded sandy beaches and shady palm trees for sunrise rows and post-practice naps. Leaving Friday, they loaded into six vans to make the trip to Clemson, SC for a week of practice on Lake Hartwell. They drove halfway on Friday and spent the night in central Tennessee. They completed the trip Saturday morning and arrived in Clemson mid-afternoon. After rigging the boats, the team took to the water for the first time this semester. Sunday began the two-a-day regimen; the rowers began their first practice at sunrise and returned for a second practice in the late afternoon. The first couple of days were spent working off the rust and regaining much of the boat-moving finesse that was lost during a long winter spent on the ergs. Wednesday saw the first intersquad scrimmage, with the Varsity 8+, the JV8+, the Novice 8+, the Varsity 2x, and the Novice 4+ racing against each other in four ten minute pieces. After a very competitive morning practice, the team had the afternoon off to explore the Clemson University campus and surrounding area. The rowers resumed their twice daily practices on Thursday and worked to prepare for their Friday races. Friday morning, the team saw their first action against other crews. The Varsity 8+ raced the Varsity 8+ crews from Boston University and the U.S. Coast Guard Academy. They defeated USCGA in all races and split races with BU. The JV8+ and Novice 8+ raced the JV8+ from USCGA; the Notre Dame JV8+ won all races, and the Novice 8+ traded victories with USCGA. Saturday morning, the team capped off the week with the traditional final workout of spring break, 2 x 2k. After two fast intersquad race pieces, the team de-rigged the fleet and set off for home. They stopped in Oak Ridge, TN for a home cooked meal at the home of a Notre Dame alum and then continued on to Kentucky. Saturday morning, the team traveled the final leg and returned home to the slowly thawing tundra of South Bend. Stay tuned for a full gallery of images! Do you want to earn the chance to compete for Notre Dame while getting into the best shape of your life? Notre Dame Men's Rowing is holding two informational meetings this week for all freshmen interested in trying out for the team. The first will be tonight in Debartolo 120 at 7:15pm. Tomorrow night's meeting is also in Debartolo 120 at 8:15pm. If you've ever thought about how awesome it would be to put on a Notre Dame uniform, this is your shot. Come to the info meeting and see what we've got to offer. Summer is here, but a new football season is right around the corner! The 2013 alumni row will be held during the first home game this year against the Temple Owls. Come out on the morning of August 31st to unite with old friends and enjoy challenging the youngsters to some healthy competition! We have a total of 75 tickets reserved for the Temple game. Please contact Alec Macdonell at amacdone@nd.edu to reserve tickets through the club. This past Saturday, the Notre Dame men’s rowing club christened its newest shell, the Rich O’Leary. All 55 team members were in attendance to welcome guest of honor Linda O’Leary. Many RecSports staffers were on hand, as well as close friends of the O’Leary family. Rich was recognized for his nearly 38 years of service to RecSports and the club sports programs. A few of Rich’s contributions to the rowing club, from shuttling members back to campus in the early morning when the old club bus would repeatedly break down, to shepherding the club through the development and refinement of the popular Alumni Row, were highlighted. Rich O'Leary, director of intramurals and club sports at the University and a former Irish men's lacrosse coach, died in July 2009. 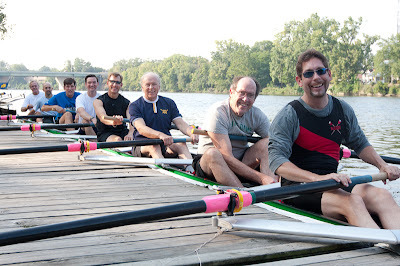 The Rich O’Leary is currently undefeated in intercollegiate competition, having won its two inaugural races. A couple of weeks ago, I rode out to Iowa to pick up the new team truck with Marty Ogren, ND's Head of Transportation and a longtime friend of the program, his wife Pam, and Adam Tirotta, an ND mechanic who worked overtime to help us out on the trip. The dealership had offered us a very Notre Dame-esque red color, which we leaped at the chance to get. I thought it was a good omen that the spec sheet listed the official color as 'Victory Red'. Once we took possession of the truck, Adam and I drove the new wheels back to campus. After staying at Transportation a few days so it could be certified as an University vehicle, we put the truck to use, hauling some older boats up to Chicago for some minor repairs. The truck runs like a dream, and I couldn't be happier with it. With proper care and maintenance, it should serve the team well for 10+ years. Special thanks must go to the Power 50 Campaign, which identified the need for a truck in the fall, and worked to make sure we received a top-of-the-line vehicle. This truck is just the first tangible sign of the momentum the campaign's generating. With the right support, I'm confident that a new Boathouse is just around the corner. After a slightly disappointing weekend at the Head of the Charles, the Notre Dame Men’s Rowing team returned to the water this past weekend at the Head of the Iowa. This regatta provided the Irish an opportunity to race against one of the country’s top collegiate crews, Wisconsin. In a day that started off rather chilly, the Irish performed very well. At the beginning of the day, the V8 was focused on one thing: reverse the margin on Minnesota from the Charles. In the Varsity Eight event, the top boat finished 5th, only losing to four Wisconsin boats. In one week they went from losing to 2 seconds to Minnesota, to defeating them by 14 seconds on a shorter course. Notre Dame’s 2V boat lost its skeg before the race started and so was unable to adequately row the course but still managed to beat several boats. The third boat finished in 10th place, but was disappointed they missed the chance to race the 2V. In the Varsity Four event, the Irish boats took 11th and 12th places. To round out the day of racing for the varsity, the Irish sent out three boats of pairs. The river was quite difficult to navigate in the toe-less boats, but the three pairs raced without major incident. They took places 12th, 14th, and 15th. This weekend was also the first time that the new novices were able to get out and compete against opposing schools. Everyone on the team was excited to see what the new members of the team could do. In the Novice Four event, the two entered boats took 10th and 19th. In the Novice Eight event, the team entered a staggering four eights, displaying the great depth this team is developing. These finished in 11th, 12th, 14th, and 15th place. Though the novices were a bit disappointed in the results, they raced hard and showed signs of real potential going forward. All in all, Coaches Phil Brunner and Jamie Baffa were fairly happy with the results from the day, but realize that much work is still needed before the spring season. The first annual NDRC team retreat provided an excellent opportunity for the new novice rowers and returning varsity rowers to get to know each other. While in Indianapolis, the team practiced 3 times at Eagle Creek Reservoir. One practice involved mixed novice and varsity lineups with some friendly inter-squad racing. The weekend also saw the novice rowers taking some of their first strokes at pressure by all 8. In all, NDRC put 8 eights on the water, making for some exciting pieces. Congratulations to all of those who made it on the team! We look forward to your contributions to the team's speed!